Welcome to March! 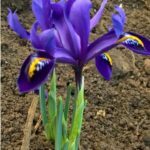 Our plant of the month is Iris ‘George’. This is one of the earliest flowering Iris. It has rich violet-blue flowers and sharply pointed pale grey-green leaves. It is hardy, growing to 12cm in height. It is ideal in pots and in any free draining soil in a sunny spot. Ideal planted in flower borders and beds in city and courtyard gardens, cottage gardens and in a rock garden.